The technology of media utopianism, 1560s-style. This week’s readings on the future of the internet seem deeply steeped in the utopianism of internet culture. This utopianism has always struck me as the most salient feature of writing about internet culture, especially by those authors who are more comfortable with the label “futurist” than I am. What we had, what we lost, what we could have, what are the threats … these are all questions that only make sense if you fundamentally assume that the internet has the potential to be a radical change agent. I know that this is a drum I’ve been beating all semester, but as a historian of print culture, I can’t help but seeing very strong echoes of much older conversations about the relationships between ideas, media, power, and social change. 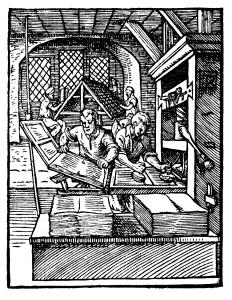 When printing was a new technology in Europe in the 15th and 16th centuries, its radical potential both excited and scared people. The theological dissidents who were in the process of inventing modern Protestantism and the natural philosophers who were in the process of inventing modern science tended to see the press and the print media it enabled as tools for radical social improvement. Individual believers’ souls would be more effectively saved through large-scale and direct encounter with the word of God in mass-produced Bibles, and mankind’s knowledge of the natural world would be immeasurably enhanced when far-flung investigators could create an intellectual community in the pages of scientific journals. Their ultimate goals … a perfect Christian society and a complete description of nature … were no less utopian than the ultimate ends prophesied by modern futurists imagining a world of perfect data interconnectedness. And like the modern internet, print also scared the powers-that-were. Governments, guilds, and churches tried to regulate the production and consumption of new media in order to guard traditional arenas of power. 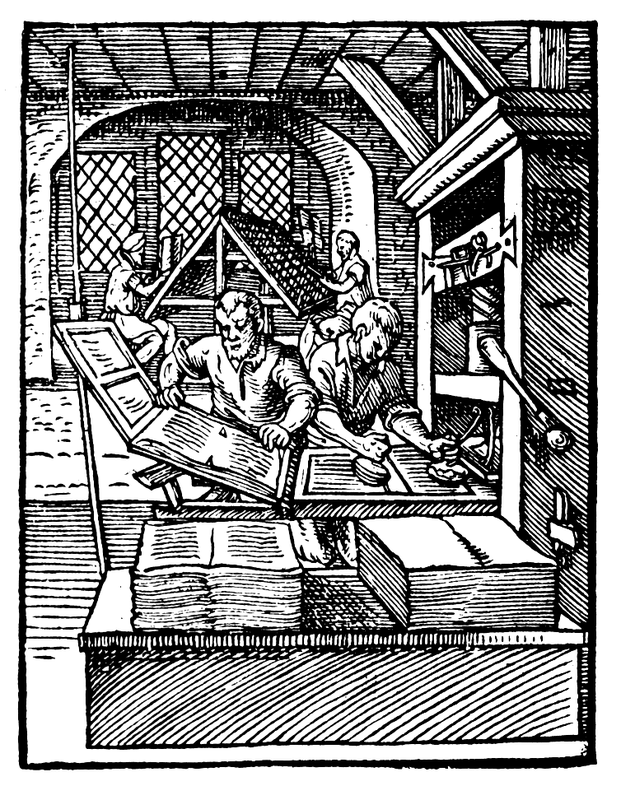 And most printers, far from being evangelists of a new society, were just trying to make a buck of an exciting new technology, and fought to preserve their ability to do so wherever they could, in the courts of kings and in the traditional governing institutions of their craft. And the world did change (although how much it changed, and how much that change can be ascribed to the new medium of print, is a subject of hot debate in the field of the history of the book). But it certainly didn’t change in the way the utopians expected it to, unless we’re living in End Times with a perfect knowledge of nature and somehow I missed it. So although I found today’s reading interesting, I didn’t find it interesting as any kind of predictor of how the world will be in the era of full data interconnectedness. Instead, I found it interesting in what it says about us, now, which is that we yearn for relationships with each other and with our stuff that we control as much as humanly possible. And what else is new. Concerns about the internet–what it is, who uses it, who pays for it, who controls it, what innovations are made to it–always remind me of radio in the early twentieth century. Most people think about television when they think of these questions, but they pre-existed tv by a few decades. Just about a hundred years ago, Americans were struggling with the wonders of wireless communication and with questions of individual v. corporate v. state control. The movement from person-to-person transmissions to scattered signals that anyone could listen to, the uncertainty about radio’s eventual business model, disagreements about how radio communication would be paid for, and concerns over the extent of government’s power to regulate, restrict, or control the use of the new communication tool existed even before World War I. Soon there were also concerns about the impact of radio on print media and about the transition from a public service medium to a tool of manufacturers and advertizers. For many people in the 1910s and early 1920s, radio was a fad that would remain limited to hobbyists and the government and military. It was simply a way, one political leader explained, for people to use their leisure time. Soon, however, the realization grew strong that radio could not only connect individuals (through person-to-person communication in its earliest versions) but also connect the nation (through music, speeches, election results, and sporting events) and allow the sharing of information (such as weather reports to farmers). To make all of this happen, some level of government regulation was necessay; even as that began, courts dealt with a growing number of legal disputes (e.g., one individual’s transmitter interfered with another’s reception). One court expressed concern that radio would “obstruct the administration of justice, offend the religious sensibilities of thousands, inspire political distrust and civic discord, or offend yourh and innocence by the free use of words suggestive of sexual immorality.” This line from Hello, Everybody! The Dawn of American Radio sounds familiar today: “Control of the radio spectrum was a balancing act between the need to organize for the good of broadcasting in general, and the desire to allow the airwaves to symbolize American freedom.” So does this one: “New patterns of behavior were developing as people made radio part of their lives.” And, if we have people who never leave their computers (or never leave the couch in front of the television set), we should remember the “Wireless Widow” of the 1920s. It’s interesting that new media often seem to produce the same kinds of anxieties.